After dismissing Jose Mourinho as ‘just another’ coach prior to the UEFA Super Cup tie, Real Madrid skipper Sergio Ramos was seen laughing at the Portuguese following his side’s 2-1 win against Manchester United. Ramos seems not to be fan of Jose, who managed him at Real for three seasons despite the duo going on to enjoy a successful period. The pair had differences in opinions, as Jose had problems with a host of first team players during his reign in the Spanish capital. After losing the European tie to the continent’s best team, Jose Mourinho was seen complaining to the officials on the pitch in the Philip II Arena, Skopje in Macedonia. Ramos was left amused by the scene, and he went on to share a laugh at his former manager for the scenario, which was caught live on television. The Premier League club suffered at the hands of Real for long periods of the game, as the Champions League winners went on to seal another trophy to add to their rich collection. In this high-octane battle between two of the most coveted clubs in European history, Real gained impetus on all fronts, as United failed to make a comeback. 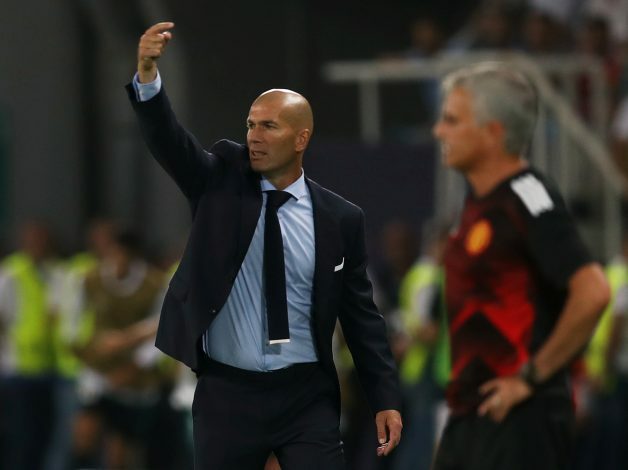 The Old Trafford boss complained in his post-match reaction as he lashed out on officials for handing Real a goal that was clear offside, besides lauding his side for a commendable show. “I think we did well. We lost 2-1 which, I think, shows the result was really short, and one of the goals was offside so with a good VAR it would be 1-1 and extra time,” said the Red Devils’ boss. Real played at a level United failed to match, as Casemiro and Isco scored for Los Blancos. Key substitutions made by Jose did see the Mancunian giants make a fightback, as they got a consolation goal from Romelu Lukaku, but they went on to spurn several chances, and were unable to take the game to extra-time.